Watercolour with pen and ink of the third design for the mausoleum in memory of Marquis Cornwallis at Ghazipur in Uttar Pradesh by W.G. Stephen c.1819. Inscribed on the front in ink is: 'Mausoleum. To the Memory of Marquis Cornwallis. No. 3. 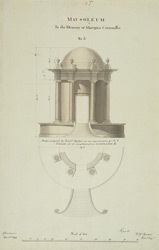 Design proposed by Lieut. Stephen as an 'improvement of No.2'. 'Estimate for its completion from 40,000 to 43,000 Rs. Sign'd W.G. Stephen. Lieut Engrs. Ghazipoor. Decr 6th, 1819'.